Although it's yet another "intellectual thriller" -- this time involving NASA and US Presidential politics -- it's not stamped out of the same mold as every other Dan Brown book to date. That is perhaps the second-most incredible thing about it. The most incredible thing about this book is that I actually enjoyed it, against my better judgement. But let's get the unpleasantries out of the way first. The book is about a startling NASA discovery in the arctic... one which can change the course of American politics. And of course there is a conspiracy to mis-direct the public regarding this discovery. 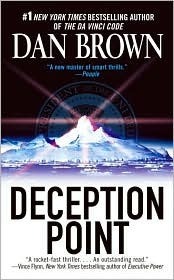 With a name like "Deception Point" you can hardly expect anything else. For a book that leans heavily on science, and which features A-list scientists in its cast, the science here is atrocious, beginning with the fact that Brown evidently can't do math. For the record, if you have a sphere of 10 feet in diameter, and its density is greater than that of water, then it is likely to weigh in excess of 15 tons, not 8. Brown also has great difficulty with geology, biology, astronomy, etc. Every bit of the "science" in this book is fraught with inaccuracies. But you know what? It doesn't really matter that much. The inaccuracies that Brown introduces are cumulatively less aggregious than those in your average episode of Star Trek: The Next Generation (and they had a "science advisor"(!)). At least Brown didn't introduce magic gravity plating, FTL engines, and Transporters. So we can get past the bad science. Unfortunately, the characterizations aren't much better. "NASA scientists" are biased and bad; "Civilian scientists" are good and honest and true. Politicians are either pure as the driven snow or are evil and corrupt. And Delta Force makes an appearance in this book, but apparently they were replaced at the last moment by the Keystone Kops in disguise, led by Inspector Clouseau. Much of the novel's momentum is driven by the repeated unlikely blunders of this "elite" fighting force. But you know what? That doesn't matter so much, either. I enjoyed Westerns in my youth even though the same simplistic white hat/black hat dichotomies were present. I'm a little more miffed about the "NASA scientists" vs "civilian scientists" thing, but it actually made sense in the context of the story... the civilian scientists were there because they DIDN'T make the discovery. They were there to confirm, thus they were characterized as being unbiased. The action in the book (and there's a lot of that) stretched the bounds of credibility beyond the breaking point. When dropped into arctic waters without a boat or survival gear, what are your chances of survival? When trapped in a disabled and sealed submarine in shark-infested waters sinking rapidly into a oceanic volcano, what are your chances of survival? When fired upon by a military helicopter with heat-seeking weapons, what are your chances of survival? Answer: pretty close to 100% if you're the protagonist in a Dan Brown novel. But you know what? That doesn't matter so much, either! After all, the Anthropic Principle indicates that it's irrelevant how improbable any event is... if we're alive to wonder about it, it happened, the odds be damned. So we can put that behind us as well. Also put behind us the improbability of Brown's portrayal of Presidential politics. Just last night we heard a State-of-the-Union address in which our president expended untold minutes extolling his plan for creating jobs through a "green energy" strategy which, if effective at all, will amount to a raindrop in the economic ocean. Politicians stress ridiculous things, so that can be put behind us as well. Given that the plot, the sub-plot, the action, the characterizations, and the science all sucked, why did I enjoy the book? Probably because this is the fourth Dan Brown book I've read and it's the first that's different from the others in any significant way. At least it's not The Da Vinci Code. And once you've suspended disbelief and just decided to go along for the ride, it's actually fun, partially because you're intrigued to learn how Brown intends to resolve the next ludicrous cliff-hanger. So I'm giving this a solid 3.5 stars simply because Dan Brown inadvertently wrote something that would make a great episode of Mystery Science Theater 3000. "...tired of hearing about Haiti. Why can't [we] hear about someplace cooler like Kenya?" This was posted to Facebook by one of my children. I responded, "Because, my cold and calculating son, natural disasters are not slaves of fashion. We will discuss." What follows is the gist of that discussion. PLEASE read this through to the end, as I think it's well worth it. Once there was a small boy who never said a word. From birth he never uttered a single sound... not to cry, not to complain. Nothing at all. One day at the dinner table, as he and his family were eating, he quietly said, "The soup's cold." His parents were astounded! His mother, shedding tears of joy, shouted, "My son! My son! All your life you've been completely silent! Never a word! And now, suddenly, miraculously, you speak! Tell me, why have you never spoken before?" The boy meekly replied, "Everything's been OK up until now." When someone is doing OK, you don't necessarily hear from them. The old adage, "No news is good news" is generally true. But when someone is in trouble you hear from them and about them A LOT. This is true whether it's another country, like Haiti, or the family in the house around the corner. You may never have met that family. You may not even know their name. But if their roof were to collapse you would help, right? Of course! We have an unusual sort of "charity" in my house. On occasion (about five times now) we invite someone in distress to live with us. It didn't start out as a conscious decision to be charitable. Rather, we knew someone who needed a "leg up" and we had some spare room. Then it happened again... and again. Once it was a young woman who was living in Florida. She was in a bad neighborhood, surrounded by drugs and "gangstas" and bad influences, with no apparent way out. She and her two sons were living in one room of a trailer. We invited her and her boys to stay with us. The deal was the same as we have always offered. Stay with us. Pay no rent. Buy no food. Don't worry about expenses. Just be part of the family, look for a job and save your money for six months before you even think about moving out. If you do exactly that then you'll have six months of wages for a security deposit, first and last month's rent, and any deposits necessary for utilities and you'll still have a little in the bank so you're not living hand-to-mouth. As I said, we've done this a number of times, and it's not really a difficult thing to do... most Americans waste enough food to feed yet another family, and we're no exception. And everybody has room, whether they think they do or not. A fold-out couch or a couple of cots... c'mon. Well, Peggy took us up on the offer and as usually happens she asked how she could repay us. The answer, as always, was, "You can't. We won't let you. But someday you'll be in a position to help somebody and you will do it. Not because I'm telling you to, but because you know it's the right thing to do." It has never once been our intention to receive some reward or "payback" for helping somebody out. A few years later my own mother took ill. She had struggled with various forms of cancer for decades, but this time it was lymphoma, and incurable. She was in a nursing home for a short time, but that really wasn't the sort of place you'd want to spend your last moments, so we brought her home to stay at my brother's house. Although hospice workers could visit occasionally, it got to the point where Mom needed 'round-the-clock care, which was completely unaffordable. By this time Peggy's kids were out of school and working, so they took over the rent on her place as she quit her job as a cashier and moved back in and took care of my mother until Mom died. We couldn't afford to pay her a salary, but again she had no rent, and no expenses, as well as the exclusive use of Mom's car (which Mom gave to her before she died. As a totally inadequate thank-you we had it completely serviced and painted). I've incidentally mentioned Peggy before. When we helped Peggy and told her to pass on the favor, we had no idea that we would be the people to benefit down the line. And when Peggy quit her job to help us, she had no idea that she herself might benefit from her own boundless generosity. Nevertheless, she did. The hospice workers noticed what she was doing, and that she was very good at it. They suggested to her that she could do this as a living. They set her up with financial aid, a part-time job at the hospital, and credited her time caring for my mother as an internship. She wound up with the best job she had ever held in her life. Her act of selfless charity turned her life around. Instead of being a low-paid cashier in a convenience store she is now a respected and well-paid healthcare worker. Isn't it a comfort to know that if someone truly needs help there's someone else in the world who is willing to give that help? Isn't that nice? But you can't know that. You can't know what's in anybody else's mind and heart. The only person you can speak for is yourself. If you want to know... for a fact... that someone in this world is willing to help a total stranger, the one and only possible way to know that is to be that person. That's the point that you can realize that no person is truly unique. We all share our humanity. There are many people like you. And if you're willing to help, they are too. Get it? If there's one person who's willing to help, there are millions. But the only way to ensure that there is one is by being that 'one'. This is why we as individuals must be charitable. If we're not, then there's no guarantee that anyone will be. And it's not enough to just let the government do it. That is a solution reserved for the lazy, the cowardly, and the apathetic. It's a way for them to not be charitable and say they are. It's a little lie they tell themselves because they don't understand what and why they should do for others. And it's wasteful. We as individuals could help someone like Peggy out without any material injury to ourselves, absolutely no expense to others, and with negative waste. By contrast, how much would it have cost to put her up in government housing with subsidized furniture rentals, provide her with food stamps, etc.? If she -- or any of the others -- had gone that route they would probably still be there. How many American homes have a "spare room" of some sort? How many people just absolutely could not put up someone temporarily? Now ask yourself, "why is anyone homeless?" Furthermore, government agencies can only do what they're set up to do. But there is no limit to the number of ways that people need help. And it's not hard. If someone is hungry, invite him to dinner. If someone needs shoes, buy some. Donate your old clothes to the Salvation Army, and drop some change in the bucket next Christmas. Smile when you do it. Donate to Toys for Tots. Watch the neighbor's kids. In terms of disasters like Haiti we can't all pick up and rush down there to dig in the rubble and rebuild. It would be chaos if we did. But the least we can do is send representatives, and the money, and the food, and the comfort that these people need. They don't live next door, but they are our neighbors and our brothers and deserve every bit of compassion we can share. Charity begins in the home, but it need not end there. * I purposely left out any mention of God and religion from this discussion. The reason is very simple. There's not one thing that I'm saying here that isn't as valid for the most staunch atheist as it is for the Pope himself. And though God may choose to reward good behavior, He doesn't owe you Jack. Nor does he make any promise as to exact nature or time of your reward. Do nothing good in this life on the premise that you will be rewarded for it. Do it because its right, or don't bother. If you don't understand this paragraph you are currently in the "don't bother" category. Now, obviously, this film is a piece of propaganda. I mean that in a good sense... "propaganda" is a word that literally means "promotion" (not "lies" as is sometimes thought). Now, watch the film and notice the number of times the word "go" is used. You go to Spartanburg, go to Greenville, go to Columbia, go to the mountains, go the beach, go, go, go. As Union is in the middle of so much Upstate SC goodness, it's natural to promote Union's proximity to all of that. But I think in doing so the film misses out on quite a bit to recommend Union itself. For instance, if you can GO to Spartanburg, why not LIVE there? There are a number of answers to that, one being that the cost of living in Union is incredibly low. I'm going to illustrate by sharing something that you have no business knowing. I live in a rather nice brick house, with a huge basement/garage (the size of the house itself) and an attached office. This house sits on a hill surrounded by mature oak, pecan, and pine trees on a three-acre plot of land about 2 miles outside the city limits. I bought it for $102K. My property taxes amount to something like $750/year. For another, the amenities are in fact quite good, in part due to the low population. For instance, Charter Cable provides internet service with actual serviceable bitrates that are quite close to the 10 meg advertised limit. That's like having a 10Base-T connection to the internet! I get a better connection here that most of my acquaintances in more "developed" areas. As a result, I'm able to work productively from a home office that I jokingly refer to as being "equally inconvenient to everywhere". The water is extremely good, and the power company (owned by the city) does a very nice job of keeping things running. The city's ownership of the power company is a major plus, in that by having such a profit center the city can keep property taxes low. The film does mention the schools, which are in fact very, very good. In addition to having up-to-date facilities, our schools are NOT plagued by "zero-tolerance" rules that haunt other districts. We pay teachers and administrators to think, and they are quite happy to do that. But here's the thing... while the film shows a lot of pretty places (not all of which are actually in Union county), and impressive things, and beats the drum of progress, progress, progress; it's the things that don't change about this place that really recommend it. When I first came to this town in 1989, Main Street closed every Wednesday afternoon. Follow that? Main Street... the whole street.... every business... closed. Why? Because everybody went to church Wednesday evening, and took time off to prepare. Main Street doesn't close any more, and it's prettier than it was, but it's still populated by good, decent people. We've had some scandals, yes. Susan Smith famously drowned her children in 1995. But such occurences are few and far between. In general, the people of Union are generous to a fault, honest, personable, friendly and hospitable. They're also creative... each year Union's Boogaloo Folk Life Productions produce and perform two completely original musical plays. (I'm happy to participate in these, as I describe here). These are based on true stories submitted by the residents of Union. I've previously described my biggest reason for adopting this town, and rather than repeating it here I'm going to link you to that account. But let me leave you with this: Union has a great location, amenities, scenery, yada, yada, yada... but it is the people of Union that make this the best place I have ever lived.